When Darkwing Duck premiered in syndication in 1991, Superman hadn’t died, Marvel hadn’t gone bankrupt, and Image hadn’t progressed beyond a glint in anyone’s creator-owned eye. Tim Burton’s next Batman movie was still a year away, as was the groundbreaking one-two animated punch of Fox’s X-Men and Batman: The Animated Series. Further away was our current era of superhero dominance, in which studios like the one responsible for Darkwing Duck would duke it out over properties that had languished in development hell for years. There was no superhero ubiquity, and therefore no ubiquitous commentary on superheroes and what made them tick. Only a few years before, Watchmen and The Dark Knight made a splash with costumed vigilantes who looked inward; a handful of cult favorites from the same area took a more comedic approach to such deconstruction. The most successful of these efforts, Kevin Eastman and Peter Laird’s Teenage Mutant Ninja Turtles, yielded an unexpected pop-culture phenomenon. Other superhero parodies like Flaming Carrot Comics and The Tick received their own crossover moments in time—but before Mystery Men, before all three TV iterations of The Tick, there was a Disney-produced terror that flapped in the night. Enter Darkwing Duck. Producer Tad Stones and his creative team used their series to reflect the ridiculousness of classic superhero comics and characters, boiling them down to a basic impulse. Why does Darkwing Duck do what he does? Because of his massive ego. That’s the basic driving force of every superhero, isn’t it? No matter how much angst, suffering, or enlightenment they experience, superheroes believe that they are the only ones who can save the city, country, or world. Darkwing Duck cut through all the existential and dramatic crap with a character who rarely pretended to have any investment in the safety of his hometown or the world at large. Darkwing Duck, himself, was driven by the need to be the best. To be recognized. To be the star, the savior, the receiver of accolades. His life is a series of comic-book panels with Darkwing providing the captions, narrating his victories with pompous declarations about “once again” saving the day. This sums up the kind of character that Darkwing is, and the perspective the show aims to satirize. The Canardian Guardian is brought about by head trauma, and her efforts show that she prioritizes her own mission over social order: almost every attempt Binkie makes to improve safety in the city of St. Canard leads to an even larger disaster. Inside Darkwing’s brain, the little hero and the ego work in tandem, attacking characters they perceive as enemies—even though those characters are Darkwing and Launchpad. Amusingly, Darkwing recognizes this. Darkwing Duck, both the show and the character, is keenly aware of the connection between heroics and vanity. “Inside Binkie’s Brain” is not a typical episode of Darkwing Duck, but its themes recur elsewhere in the series. Angst and distrust usually keep characters like Batman or Daredevil from working with others, but on Darkwing Duck, the lead is held back by his own narcissism. Darkwing chafes at being identified as the Canardian Guardian’s sidekick; in the two-parter “Just Us, Justice Ducks,” he nearly brings about the destruction of St. Canard when he refuses help from several other heroes. He seethes with jealousy when ultra-powered, ultra-idiotic Comet Guy (a Superman analogue) arrives in his orbit, but Darkwing relishes the opportunity to train the flying lummox in “Smarter Than A Speeding Bullet.” When Comet Guy returns in “Planet Of The Capes,” he brings Darkwing to his home planet to be the one, un-powered person who always needs saving. But Darkwing cannot abide, and he goes as far as to turn Comet Guy into a villain just to satisfy his own selfish needs—Darkwing Duck’s equivalent of the old belief that superheroes indirectly create their own supervillains. That sense of vanity could also be used to lampoon the superhero business as a whole. When he attempts to alter his image in a new comic book or fights back against being replaced as the main character of his own TV show, Darkwing demonstrates that he doesn’t just want attention. He wants to control that attention, too. “Comic Book Capers” and “A Star Is Scorned” pit Darkwing against a different kind of villain: Executive types who want to change who Darkwing Duck is, for their own sake. They don’t understand that Darkwing and ego go hand in hand, like Superman and truth and justice, or Spider-Man and the tension between power and responsibility. Inspired by the outrageous stories and grabby covers of Silver Age comics—“The Zebra Batman!”, “Menace Of The Reverse-Flash!”, any given issue of Superman’s Pal Jimmy Olsen—and vintage Disney and Warner Bros. shorts, Stones put a premium on concepts and gags. In its early episodes, Darkwing Duck was much broader in its satire, playing fast and loose with origin stories, character arcs, and continuity. “It drives fans crazy, but I was not a huge fan of continuity,” Stones told The Hollywood Reporter in 2016. As he explained to Animation World News in a 2004 interview, “Darkwing was on a whaling ship in one episode, maybe he’s in the old west, I didn’t worry how he got there. 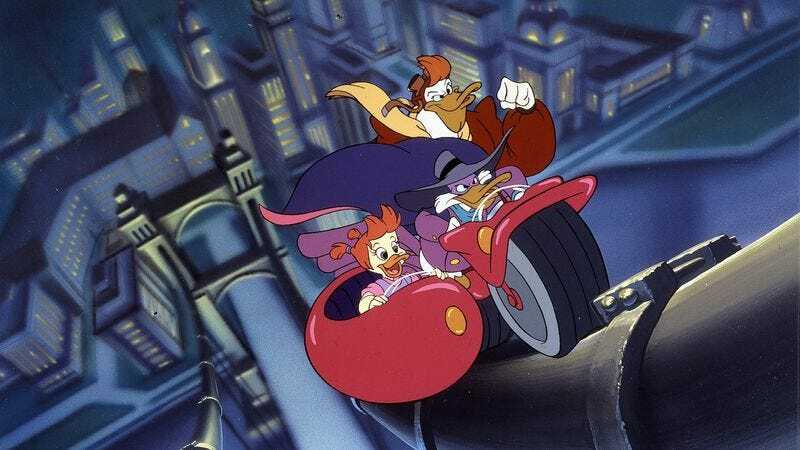 In fact there’s an episode called ‘The Secret Origins Of Darkwing Duck.’ We did three new origins for him, and I wanted to do another one where we had three more origins, except we ran out of episodes.” The show grew more character-driven over time, as Darkwing formed a circle of trusted allies: Launchpad (whose undying admiration and cool gear is really the only reason why Darkwing allows him to stick around at first), adopted daughter Gosalyn, and on-again/off-again girlfriend Morgana. But he’d remain the same guy he is in the series premiere, the self-serving attention hog who drops a criminal off with the police, along with a business card and a photo—you know, for the newspapers. What gives this behavior weight is the fact that Darkwing, for all his bluster, is a capable, smart superhero. But his focus projects outward, as opposed to the sometimes eye-rolling introspection of today’s heroes. Darkwing Duck doesn’t often suffer from the crushing, confusing self-doubt that plagues the Marvel stable–but the show does manage to note how his bombast masks a sadder, lost soul. When his crime-fighting skills are hindered in “Duck Blind” and “Going Nowhere Fast,” the show offers deeper insights into Darkwing’s psyche. Without his eyesight or his relatively young age propping up his heroics, Darkwing becomes deeply depressed, which forces Gosalyn in particular to try and prop up his confidence. Even when Darkwing Duck rips into the narcissistic nature of its hero, it makes sure to connect it to the very reason for his actions, criticizing superheroism while also explaining it. That’s really the sum of it. Today’s superheroes may be capable and driven, but no matter how much dramatic heft they gain from their backstory, they are ultimately driven by the sheer force of self-centered will. There’s no Uncle Ben, no Crime Alley, no Weapon X, and that allowed the show to focus on Darkwing Duck and how, beyond anything else, it’s solely his ego that makes him who he is. Darkwing Duck doesn’t judge him for his conceitedness either. It may comically punish its titular hero for his more egregious bouts of arrogance, but the show also allows it to define him. The last 30 years of superhero entertainment have demonstrated the psychological and thematic depths that can be drawn out of these characters. Darkwing Duck asks: Why bother? Darkwing Duck is a comically vain but proficient crime-fighter constructed by a conglomerate of creatives and executives. Origin stories and psychoanalysis are irrelevant. Just get dangerous.